Fitted with a Trijicon TARS 3-15×50 scope, a Harris bipod and a Hog Saddle tripod mount, the Proof Research Tactical II is a wind-resistant tack driver. The weight-saving carbon-fiber barrel allows hunters to add more powerful optics and field-shooting aids to guarantee a first-round hit. 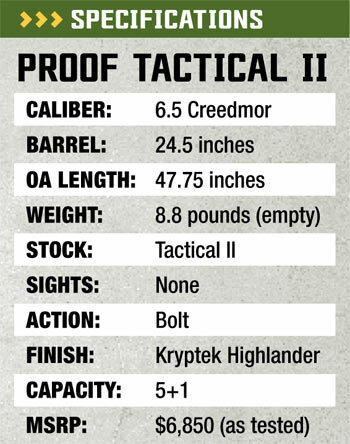 See how the author and his PROOF Research TAC II in 6.5 Creedmoor stack up in Magpul’s Precision Hunter Course. Copyright © 2013 Rifle Firepower. All rights reserved. Used by permission. The anticipated and sublime moment is upon you. You have aced office deadlines, saved dollars, burned vacation days and fended off an onslaught of distractions and competing interests to get here, up-range from the 7×7 Rocky Mountain bull elk. Countless times in your dreams you saw with perfect clarity the elk lift a chandelier of polished antlers and bugle into the mountain mist. You waited 12 years to draw the tag and you are missing both of your kid’s soccer games, but this is your moment. Unfortunately, though you bought the best optic and rifle you could afford, you cheated the fundamentals and bet long against the laws of nature. Taking a shot across a steep mountain valley to put a magnum round through the boiler room of this trophy bull is a galaxy away from sitting on a benchrest at your local range. The familiar, level concrete is now a loose scrabble of rock laying at 45 degrees below your feet. There is a shadow across the top of your scope, and the image of the elk is a fuzzy silhouette. Your thousand-dollar rangefinder says he is standing 407 yards away, which only vaguely translates to the lines and dots in your scope. You struggle to hold your rifle steady as a cocktail of adrenaline and the unfamiliar, unsupported position combine to make the crosshairs bounce like a cricket across your over-magnified sight picture. Without definitive guidance, your eyes and mind put the crosshairs on the middle of the elk and your finger jerks the trigger. The shot falls woefully short of the mark, and in a flash the elk is over the next ridge. Your only pathetic consolation is that you didn’t leave a wounded animal in the field. You have blown it, and now all you have to look forward to is an empty-handed return to the grind. You don’t have to be this guy. 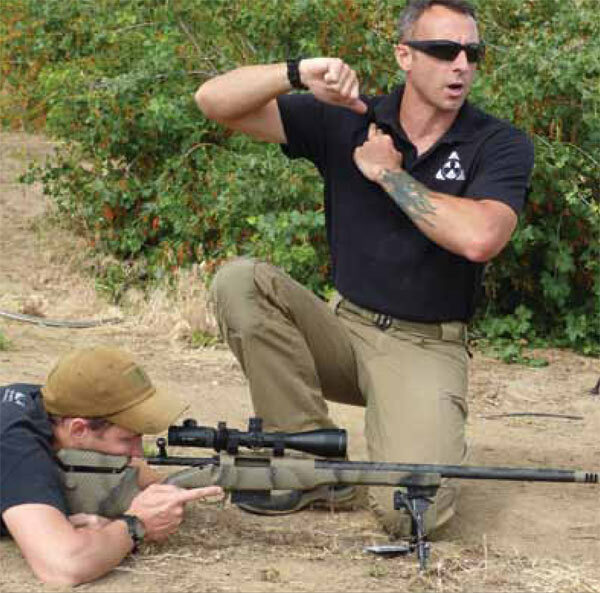 Precision shooting in the field is about learning, then mastering the basics with modest practice. A once-in-a-lifetime shot should be a glorious moment of fulfillment, not a tragic disappointment. Training is the answer, and Magpul Dynamics has a customized Precision Hunter course designed to help hunters get the most out of their equipment and enhance their skills. I decided to put some modern technology to the test along with my shooting skills at the Precision Hunter course. Proof Research is a high-tech rifle manufacturer that’s the product of combining Lone Wolf Rifle Stocks, Jense Precision and a patent for carbon-fiber barrel technology. The company also recently acquired Performance Polymer Solutions, a company that makes components for the F-35 Strike Fighter. 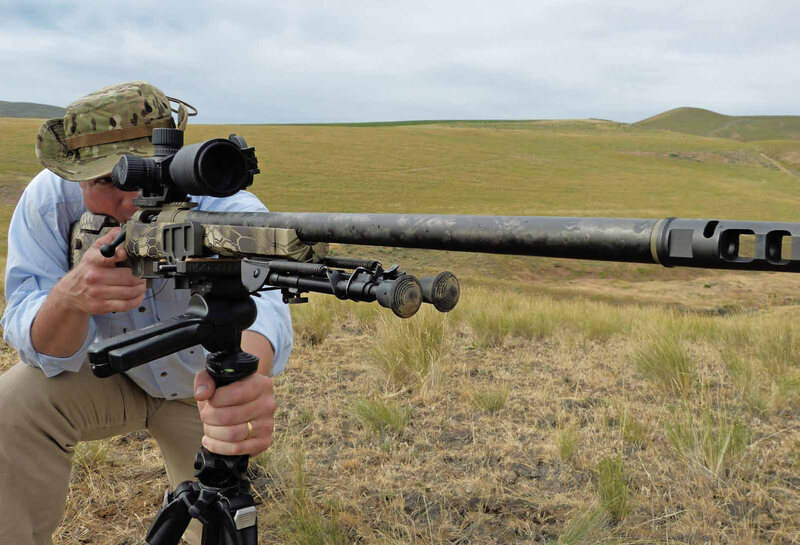 The Montana-based rifle company engineers lightweight precision ARs and bolt actions built around its proprietary carbon-fiber-wrapped precision barrels. Proof’s carbon-fiber wrap is a patented innovation that reduces weight and increases durability and consistency. Carbon fiber is 14 percent stiffer than steel and is seven times stronger per weight. As such, a typical 16-inch AR rifle barrel’s weight is reduced by 27 percent, and a hunting rifle barrel can weigh as much as a 40 percent less. Carbon fiber is not a particularly new material, but it continues to show up, replacing metal and even other synthetic composites where a decrease in weight and an improvement in strength are desirable. However, weight reduction is not the primary reason Proof utilizes carbon fiber; rather, it’s a fortuitous by-product. Carbon fiber is not only stronger, but it also reduces the amplitude of the barrel’s harmonics and improves heat dissipation. The result is a bullet that leaves the barrel with less harmonic interference (pitch and yaw) and stays cooler shot after shot. Where precision shooters have had to make steel barrels thicker to offset these phenomena, the carbon fiber accomplishes the task while reducing the weight. Proof isn’t the first company to wrap its barrels in carbon fiber, but its reputation for getting it right—creating a rifle that is as strong and light as it is consistent and accurate—precedes it. Proof’s Derek McDonald notes, “It’s not just about the carbon-fiber wrap. Our steel barrel cores are match-grade and precision cut. No technology can make up for a poorly engineered and sloppily cut barrel.” Proof brought a rifle company in-house and considers the barrel manufacturing its core business. “Starting at $900, a shooter can have a Proof barrel custom-built to fit their favorite bolt action.” Designed to be fit by a gunsmith, Proof barrels are shipped threaded and chambered in a wide range of common calibers and standard twists with options for barrel lengths and external contours. So if you have a trigger, stock and action you prefer but want to upgrade or replace your barrel, Proof has an answer. For the Magpul Dynamics course, I ran a Proof Tactical II rifle chambered in 6.5 Creedmoor. Proof set the rifle up with a modified tactical stock that features a near-vertical grip and an adjustable cheekpiece. It looks a bit high-tech for a hunting rifle, but the weight savings from the carbon-fiber barrel balances out additional features that would otherwise be reserved for a benchrest or tactical rifle. Jewell made the trigger on this rifle, but Proof also outfits its rifles with Timney triggers. The rifle also has a Kryptek Highlander camouflage finish and came with a Harris bipod, which became a surprisingly versatile and frequently utilized shooting platform in the course. The barrel is 24 inches long with 1-in-8-inch, right-hand twist. The Tactical II also features a detachable five-round box magazine. For optics, I mounted a Trijicon TARS 3-15×50 scope in a GDI quick-detach mount. The TARS is a rugged beast of a scope made from aircraft-grade aluminum with 0.25-MOA adjustments and magnification in the first focal plane. It also features a battery-powered, 10-setting, 0.33-MOA illuminated reticle. The small illumination at the intersection of the crosshairs is a significant aid in target acquisition and sight picture alignment, particularly when the target and the background are dark colors. All together, with the optic mounted, the rifle weighs just under 12 pounds unloaded. The final element was the 6.5 Creedmoor ammunition. I chose the 120-grain Hornady A-MAX. With a G1 ballistic coefficient of .485 (a measure of the efficiency of the shape of the bullet as it passes through the air), the 6.5 Creedmoor dramatically reduces the effect of wind on the path of the bullet. Generally speaking, the bullet flies similarly to a .300 Winchester Magnum, but with a fraction of the recoil. Wojcik then taught a brief lesson in external ballistics. Magpul Dynamics provided Applied Ballistic Mobile Calculators for the students, but some students had calculators of their own, and used them to develop DOPE (data on previous engagement) sheets for their respective rifles. DOPE gives the shooter a table for where the bullet will strike at specific distances. Shooting across a flat valley at multiple steel targets at known distances of up to 800 yards, students worked in pairs to make scope adjustments and determine holdovers at the various ranges. Through some initial frustrations, confidence grew as the fundamentals became more harmonized and shooters learned they could use their tools in a consistent manner. An afternoon of ringing steel and smiles replaced the furrowed brows of the earlier morning. I was spoiled. The large turret knobs of the Trijicon TARS adjusted the Proof rifle and 6.5 Creedmoor bullets through the course of fire with relative ease. Largely agnostic to the wind, particularly at ranges within 500 yards, the A-MAX rounds and Proof rifle ate the course in methodical bites. However, the rifle was made for this type of shooting, and the following day would provide a whole host of new challenges. If Day One was a tune-up, an oil change and a detail of the hunter’s components, Day Two was a road race through an unfamiliar city. Gone now were the flat, level ground and comfortable shooting pads. This day we stood, kneeled, sat and used bipods, tripods, shooting sticks and existing obstacles to our advantage. We also utilized bipods in ways we couldn’t have imagined. For example, rather than supporting a sliding stock on a limb or fence rail, we deployed just one leg of the bipod, which gave us right-angle support points on both the vertical and horizontal planes. This allowed us to slightly lean into the rifle and “load” weight and stability into the firing position. Though it took some practice getting the feel for a slightly unfamiliar body position behind the rifle, the stability of the crosshairs with the bipod-supported position was quickly obvious. Given its extra weight, many of the students, including myself, originally questioned the value of having a bipod on a hunting rifle. But after utilizing them in more than just belly-down firing positions, the collective consensus was that bipods were definitely valuable additions to modern hunting rifles. The course of fire continued across various target ranges utilizing fence rails, debris piles and cable spools as simulated natural obstacles. Students found personalized ways to adjust their body positions and bipods to support their rifles and deliver consistent shots downrange. Perhaps the most notable portion of the course was instruction in the use of portable support devices, such as shooting sticks, tripods and trekking poles. It’s a common sight on an African safari to see hunters shooting off of thin sticks. So why is it so rare to see North Americans using them? The shots aren’t any more difficult in Africa. Their omission is certainly an oversight of vanity or habit. The addition of even the lightest, crossed shooting sticks will enhance the consistency of a shot in the field. You don’t get extra points for shooting off-hand at distance; in fact, choosing to do so when a supported position is possible should be rightly viewed as unethical. But the deployment and utilization of any shooting aid has to be practiced to be of any value. And with each option there are techniques that work more effectively for people of specific body types and physical abilities. One simple but ingenious takeaway was the use of an inexpensive pair of trekking poles as shooting sticks. A valuable piece of gear in the backcountry, trekking poles lend stability across rocky terrain and help spread the load off of leg joints while hiking. A simple wrap of the handles through the wrist straps and the trekking poles become a stable bipod for a shooter in a seated or kneeling position. Modern carbon-fiber trekking poles weigh little more than even the cheapest fiberglass shooting sticks, and their versatility makes them a no-brainer addition to any backcountry packing list. The course stressed the importance of a solid cheekweld, even if it means adding a field-expedient solution (left), as well as using bipods for vertical and horizontal stability (right). As for the Proof rifle and the Trijicon scope combination, with its 0.38-MOA groups, the rifle performed beyond any reasonable expectations. The only limitations of the ­­­rifle were in the hands of this shooter.